Heungbu & Nolbu or 흥부와 놀부 is a traditional Korean story which was written towards the end of the Chosen Dynasty (mid 19th century) by an unknown author. The story of Heungbu & Nolbu is normally told to Korean children as a bedtime story, and features two main characters brothers Heungbu & Nolbu. The story teaches that if you are good and help others then you will live a happy and successful life. 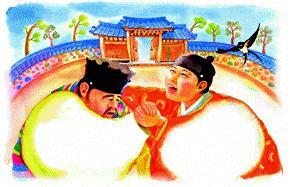 This story is considered one of the most popular traditional Korean fairy tales or stories. To help you read, learn and enjoy this traditional Korean story we’ve written our own version based on the traditional story. Also we’ve made a complimentary worksheet to help with your comprehension. Both the story and the worksheet are all in Korean and therefore are designed for students at a high beginner or intermediate level at least. Thank you for your time and if you have any questions please feel free to let us know. For more practice Korean Conversations and more Korean downloads check out our FREE RESOURCES PAGE. For details on our Korean Classes please Click Here.